Join us as we partner with Royal Irish Tours to experience Ireland. We’ll experience magical landscapes; visit quaint villages and the traditional yet cosmopolitan cities of Dublin and Belfast. In addition to daytime touring on our first class coach tour, we plan to visit local pubs where you can enjoy lively Irish music and traditional dancers. Meals not specified & items of a personal nature. Itinerary subject to change based on local travel conditions. Minimum group size is 30. Payment - Airfare - Full payment due by February 15, 2019. Cancellation Penalty - Non-refundable once paid. Coach Tour - Deposit of $300.00 per person due at the time of booking. Payment by cash or cheque (payable to Square 1Travel) or credit card (Visa & MasterCard only). Final Payment is due by March 15, 2019. Cancellation penalty: Deposit is non-refundable. Tour is 100% non-refundable after March 15, 2019. Insurance: We recommend purchasing travel insurance. Please contact Willy van Kemenade at 250-339-7628 for a quote. Name changes are permitted for a fee of $100.00 per person plus any supplier fees, only if there is a waiting list or if you can find someone to take your place. Responsibility: Square1 Travelplus is a vacation organizer only and cannot accept responsibility for any loss, damage or physical or personal injury of any nature resulting from delays, suppliers, Acts of God or any other force majeure. with Westjet 787 Dreamliner from Calgary to Dublin with connections from Comox and other cities in western Canada. Today is leisurely as we gather in our hotel in Malahide overlooking the Irish Sea in north County Dublin. Enjoy a pre-dinner drink and an introduction to your travelling companions before an early dinner. Head north through the majestic Mountains of Mourne into Saint Patrick’s Country to visit the grave of Ireland’s Patron Saint and the Saint Patrick Centre which tells his story. A guided tour of Belfast City Hall is first on the agenda this morning. Next, experience what life was like for a prisoner in Belfast’s Crumlin Road Gaol. In the afternoon, visit the shipyard where the Titanic was built in 1909, followed by a tour at the Titanic Experience - recently voted Europe's top visitor attraction. The evening is free to explore the Northern capital on your own. This morning we drive north along the Antrim Coast and visit the Giant’s Causeway. We then continue to Derry where a local guide will tell the “Story of Derry” on a walking tour of this historic walled city. Today we’ll visit Belleek, home of the world famous porcelain factory. We then enter the romantic domain of W. B. Yeats via Drumcliffe where he is buried and other sites in Sligo associated with the life of the poet, before continuing to Westport. Today we’ll go to Connemara, one of the wildest and most romantic places in Ireland. 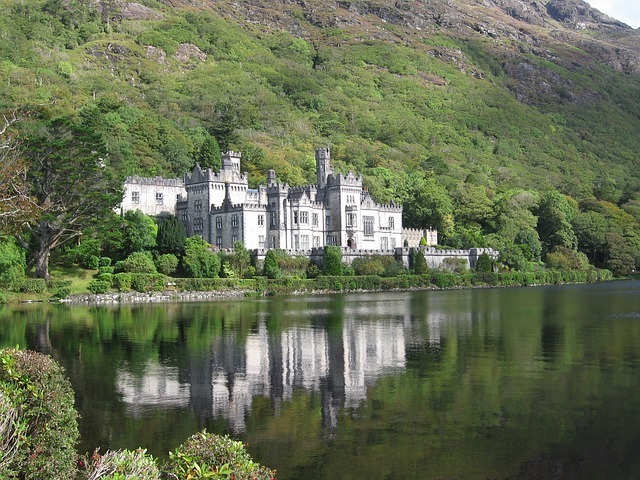 We’ll also visit Kylemore Abbey; and have some free time this afternoon to discover the charm of Westport. Burren region and viewing the mighty Cliffs of Moher. Optional medieval banquet or perhaps enjoy the evening at Durty Nellies bar. This morning we visit the Kingdom of Kerry Museum in Tralee. We will visit the fishing port of Dingle and view the Blasket Islands as we round Slea Head. Enjoy views of the Lakes before returning to Killarney. We take the short drive to the heritage town of Kenmare this morning. We then travel the Ring of Kerry road back into Killarney thru’ Moll’s Gap where we visit a traditional working sheep farm. Enjoy a jaunting ride thru’ Killarney National Park, and later this evening you are invited to Quill’s Farmhouse for a traditional Irish dinner and entertainment. the stone endows the kisser with the gift of the gab. We head to Tipperary & visit Cahir Castle and the town of Cashel, before arriving in medieval Kilkenny. Museum and the Japanese Gardens. A panoramic tour of Dublin is undertaken before arriving at your city hotel. This evening, a free night to explore the electric atmosphere in Dublin. Today is your first free day to explore Dublin's 'Fair City.' Check out the famous streets, squares, historic buildings, perhaps a local pub and the great shopping opportunities before our farewell dinner & lively Irish entertainment this evening. Final hearty Irish breakfast at our Hotel. Non stop flights with Westjet 787 Dreamliner from Dublin to Calgary with connections to Comox and other cities in western Canada.